Despite the fact that poetry predates the novel - so far as the world knows - many people nowadays attribute poetry to decorative writing created for the sole purpose of being vague and incomprehensible. However, what critics of poetry tend to forget is that songwriting is a form of poetry, and so they are therefore not as unfamiliar with the form as they would like to think. Listen to any song today and you will most likely hear some sort of story, albeit a bad one maybe, but a story all the same. People will sing lyrics about people they love or people they hate, and what makes it so interesting is not always the person being sung about, but the singer herself. The notion of writing about someone in a poem, however, is not a new one and dates back thousands of years, which is why I have elected for us to study the Shakespearean sonnet and what it does for character in your stories. There is no doubt that Shakespeare was a man who knew how to write great, complex characters in his stories, whether they were comedic or dramatic. While it seems like the obvious choice to study is what his plays can teach us about character, I believe that by studying his sonnets one can learn how to give a lot of information on character in a short amount of time, something every storyteller must learn how to do. Also known as the English sonnet, a Shakespearean sonnet is composed of three quatrains and a couplet, totaling fourteen lines all written in iambic pentameter. For those who are unfamiliar with these terms, a quatrain is four lines grouped together in what is called a stanza, and a couplet is two. Unlike the Italian sonnet, the form allows for more play with the volta, otherwise known as the "turn" in the poem, a climatic moment where all becomes clear. The turn can occur at line 9, or it can occur in the final couplet or anywhere else the poet decides, though it is generally in the couplet in Shakespearean sonnets. Already you may be noticing how a poem can imitate a character's story, considering how the "turn" in a sonnet is much like the climax in any other form of storytelling. Keep that in mind as we begin to analyze the sonnet and think of ways in which you can follow the form of sonnet to learn more about character. While I have read sonnets by other poets that I have enjoyed equally as much as Shakespeare's, I believe Shakespeare to be the best choice for a few reasons. Not only are people most likely more familiar with him, but also there are many scholarly resources available should you choose a sonnet that troubles you. Additionally, Shakespeare often writes his sonnets about men or women, something I think provides more depth and strays from the usual sonnets only written about females. Given that theme, I have elected to use Sonnet 20 as my example. It is my favorite sonnet by Shakespeare because not only does it play with form in so many ways I cannot begin, but also because upon closer examination, it tells a very tragic love story about how Shakespeare wishes the man he is writing about was a woman - or that Shakespeare himself were a woman - so that they might be together. Already you may notice there is a story just within that summary, but let us take a closer look at the piece itself, which I have copied below for you, and see how it tells that story and what it does for character, our main focus. "A woman's face with Nature's own hand painted Hast thou, the master-mistress of my passion; A woman's gentle heart, but not acquainted With shifting change, as is false women's fashion;An eye more bright than theirs, less false in rolling,Gilding the object whereupon it gazeth; A man in hue, all hues in his controlling,Much steals men's eyes and women's souls amazeth.And for a woman wert thou first created; Till Nature, as she wrought thee, fell a-doting,And by addition me of thee defeated, By adding one thing to my purpose nothing.But since she prick'd thee out for women's pleasure,Mine be thy love and thy love's use their treasure." There are many resources online which can analyze this poem far better than I can, so for this exercise I am going to only focus on how the sonnet tells a story with an emphasis on character. The first quatrain is written in such a way so as to deceive the reader - at first. From the beginning, you are led to believe the person being described is a woman until you notice little slips in the dialogue such as "master-mistress," which hints at the subject being male. What is worth noting is that the first quatrain tells us as much about the narrator as it does our "protagonist," much like the opening act of a film or play might introduce characters to us. We know from the first four lines that the person being described is very handsome and kind, but not overly emotional. That final detail alone clues us in to who exactly this person is, even if it's not clear yet the poem is about a man. What we can gather about the writer from our intro is that he clearly has had experience with "false women," and while he admires their beauty and tenderness, he prefers a relationship without flighty feelings. All of this was conveyed in four lines of poetry, yet already we know the situation at hand and what the narrator's goal is - to be with the subject of the poem. Consider this part of the sonnet to be like the first part of Act Two when we still have much to uncover about our characters, but we know more than we did the first act. One thing we learn is that the man the narrator writes about is evidently so beautiful he even "steals men's eyes," though in what way - sexually or in admiration - it is not exactly clear. Additionally, the second quatrain is the first time the word "man" is used in this sonnet, and it becomes clear now that whoever this is has a command of their beauty that effects all sexes. There is not nearly as much revealed about the narrator here in terms of character except that they really admire the person they are writing about and they know many other people do too, keeping this in mind with perhaps even with a touch of jealousy. This is the most tragic part of the poem, when nearly all is revealed except for the narrator's reaction or solution about the situation, which will be revealed in the couplet. This is the most climatic moment of the poem - at least for this one - and now are we as readers truly able to piece together how the narrator feels and the full story. Shakespeare doesn't hold back, stating in the first line of this quatrain that "for a woman wert thou first created." Now we can hear the despair coming to surface in the narrator's voice. At first he resolved to admiration, then in the next quatrain he hinted at his woes but did not give them too much attention. Yet now the narrator fully reveals his character in a way that is most rewarding because with each quatrain more and more was uncovered. This final quatrain makes it easy to understand how sonnets represent character so well. We as humans innately like to cover things up when something emotional is at stake, yet over time the more we talk and know people, the more honest we become. Keep that notion in mind when tackling your own characters! Even those who are an open book are behaving as such to hide something else. Analyze your first Shakespearean sonnet + learn about character with my free worksheet! The couplet, especially when used with the volta, is what makes the storytelling form in a sonnet about character. When stories often use epilogues or conclusions to explain things, it is often used for clarification or peace of mind to the audience. The final couplet for me is very character oriented because it is about the person speaking's way of resolving the issue within themselves. Here the narrator, though sad, comes to terms with the fact that he too is a man and therefore cannot be physically with this person, so in turn he decides that he will love the man spiritually while nature calls for him to sleep with women. The narrator has comes to terms with the reality of the situation and his character is at peace as a result. Not every couplet may end this way, but it is important to examine what the character settles on in the end, be it happy, sad or somewhere in the middle. Now that you have witnessed how I have analyzed this poem for character, I can explain by way of that example how I might take this sonnet and use it for character. One exercise I could do would be to create a character with the same sort of dilemma at hand as the narrator and to track his story according to the style of the quatrain. I could do it literally, writing a short story or film about a gay man falling for a straight man or two lovers living in conservative times, or I could weave it into a story of mine that already exists, creating a subplot of sorts. This is the more direct way of doing it, but sometimes you may read a sonnet and love it to death, but have no room for a character like that in your story. If that is the case, it's time to think in terms of the bigger picture as to what your sonnet is getting at. With Sonnet 20, I could simply write a character who is hiding a desire of some sort because they know deep down their desire can never become a reality, but over time eventually reveals it to someone and settles for a compromised version of their dream. It still embodies the shape of my sonnet, but it is more applicable to a wide-array of different stories and no longer constrained to romance. Screenwriting:In screenwriting, every page and word counts, so there is little time to dabble about. 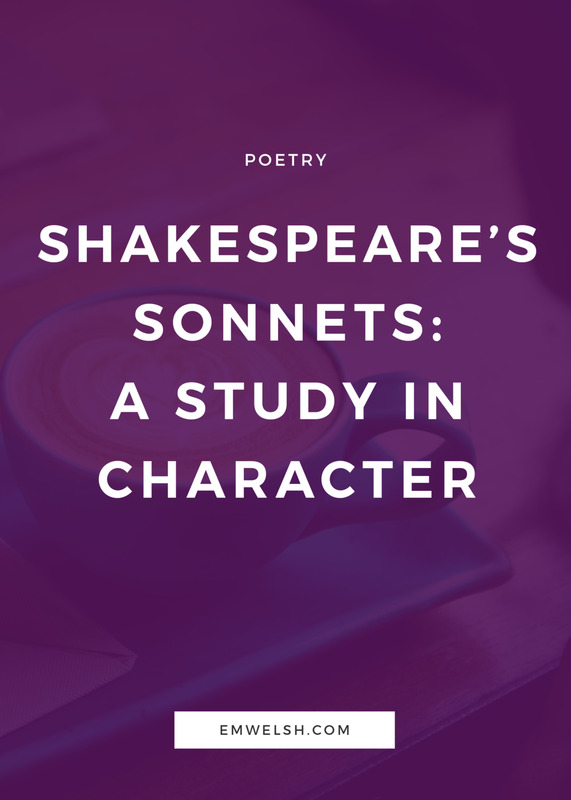 Studying sonnets can teach you a lot about how to pack in as much information in a sentence as possible about your character, but they can also teach you a lot about writing dialogue for your character. Remember, there is a voice behind every sonnet, and studying how this voice wavers between two choices until the final couplet paves a great narrative for how your characters may discuss their feelings with other people. Treat the quatrains as the face your character puts on until the final act in which they find the answer to their dilemma. Playwriting: Unlike the other forms of storytelling, the ways in which a sonnet can teach you a lot about character are quite obvious in playwriting. Here is a place where people can stand on stage and express their feelings directly to the audience, something Shakespeare did very well. However, what you can also do is look at how your sonnet chooses to unravel its character and try to emulate that in conversation instead of solely monologues. Fiction: Besides the exploration of a character's arc, fiction allows two different voices to exist if one so chooses, allowing for a great exploration of character via an unreliable narrator. Your narrator does not need to hide themselves like in Sonnet 20, but because sonnets are usually written to someone from someone else, you can mimic not only the arc of your sonnet in a story, but also the ways in which the voice of the sonnet plays with meaning and truth. Video Game Writing: The trick about video game writing is that the person playing the game is the storyteller, and therefore considers themselves the main character. While you can certainly track emotional states in the main character if it is a game like Bioshock Infinite, other games where players create their own character make it difficult to use this sonnet exercise on them. Given that, the ideal place to create characters from sonnets are in two places: side characters and quests dealing with NPCs. Bioware does a great job of telling stories with side characters and may serve as a good example should you normally write RPGs. Not sure where to begin? Try Sonnet 18 or Sonnet 130. These are some of Shakespeare's more famous sonnets and therefore should have many resources online to help you should you have some trouble discerning their stories. Or if you're feeling lucky, try searching a random number and see what you find! There are 154 sonnets to choose from, plus hundreds of other poets who wrote great sonnets.